"People around the world celebrate different festivals and joyous holidays throughout the year. Whether it is Christmas, Diwali, or Eid, it is wonderful to see everyone come together and celebrate the holidays. 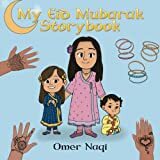 The Eid Mubarak Storybook is a fun and exciting book that teaches children about the traditions of Eid. Join Emaan, Inaaya, Noorah, and their friends as they get ready to celebrate Eid this year. Read about their exciting Eid plans. We just love the festive holiday season and learning about different festivals and cultures, don?t you?"